CRAYOLA TWISTABLES CRAYONS never need sharpening, just twist to keep the color going! The durable plastic barrels are clear to let kids see the color inside while protecting against breakage. 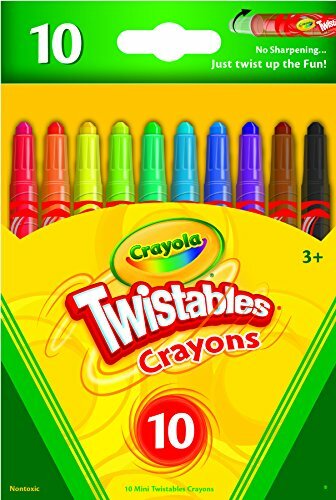 This pack offers 10 Mini Twistables Crayons in assorted colors. CLASSIC COLORING: These simple tools have the ability to unleash countless hours of self-expression and imaginative play. Looking to update your crayon collection? Check out our exciting specialty packs, like metallic, glitter, and even fabric crayons. CREATIVE PROJECTS: Whether you're creating a landscape masterpiece or decorating t-shirts with your Girl Scouts troop, Crayola has the markers, pens, kids markers, paints, colored pencils & crayons you need to make your project pop in bold, bright colors. CRAYOLA CRAYONS are a must-have art supply for your tiny Van Gogh. The classic colors are always a hit with kiddos, from My First Palm Grip crayons for toddlers, to Silly Scents, & Ultra Clean washable crayons, to the 152 piece Ultimate Crayon Collection. FROM MARKERS TO SIDEWALK CHALK: Markers for kids or adults, washable paints, bright crayons, even scented markers, we've got it all! Crayola gives kids the power to express all that inspires them as they explore, discover, play, pretend, create & dream.